E A S T H I L L S , N. Y. Location: Village of East Hills in the Town of North Hempstead, Nassau County, N.Y.
Open for sales October 12, 1947. Community located on the south side of Harbor Hills Road opposite the Mackay Estate between Roslyn Road and Glen Cove Road. 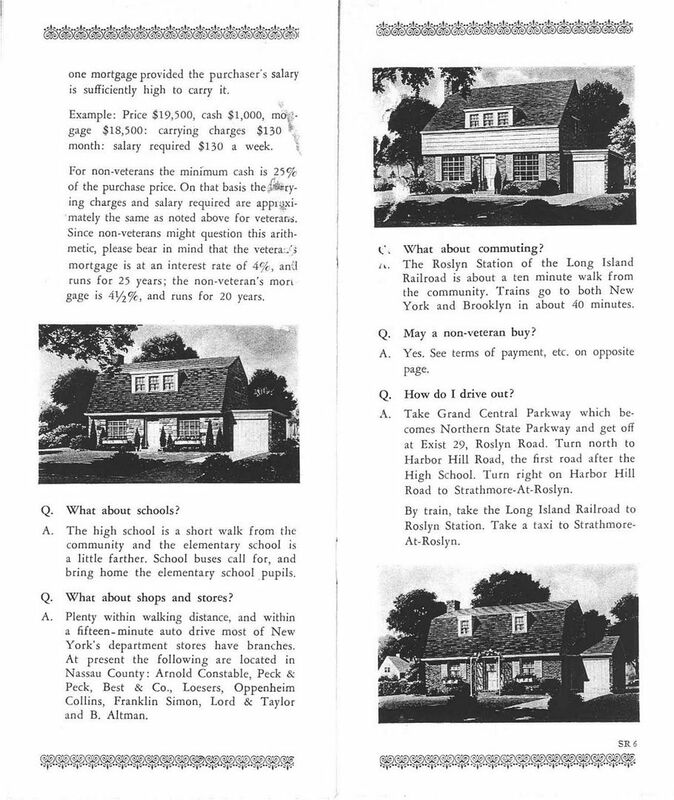 Official web site for the Village of East Hills, incorporated from the town of North Hempstead in 1931. Official web site for the Town of North Hempstead. Courtesy Jeffrey Auchter and Paul Lisicky, F.M. 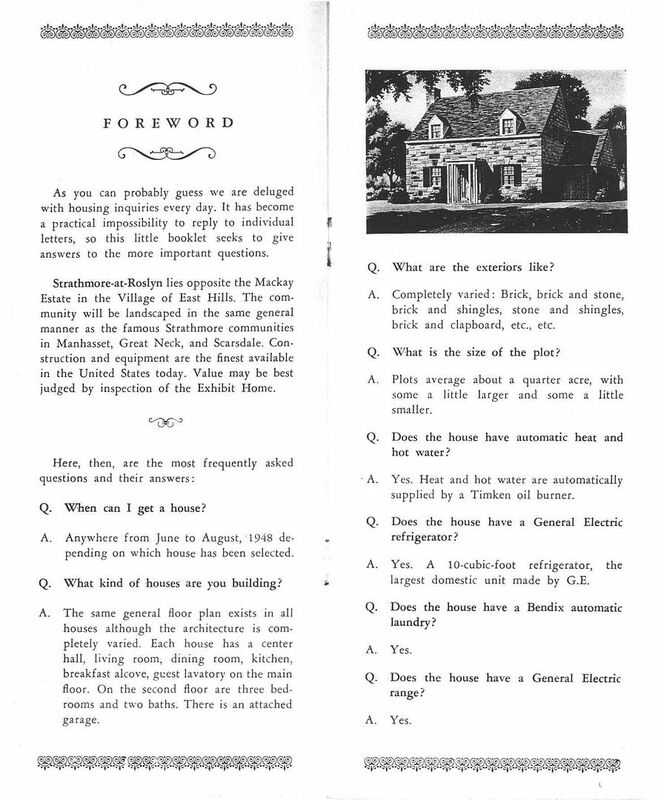 Pages 1-2: Foreward, description of the homes, and standard equipment. Pages 3-4: Standard equipment, prices, and fees. Pages 5-6: Terms, community amenities, and directions. Renderings of the houses available throughout the brochure above. The interior plan of all homes is identical, while the exteriors are quite varied. Buyers may choose from nine exteriors for their new home at Strathmore. View press releases and news articles for Strathmore at Roslyn. View original newspaper sales advertisements for Strathmore at Roslyn. 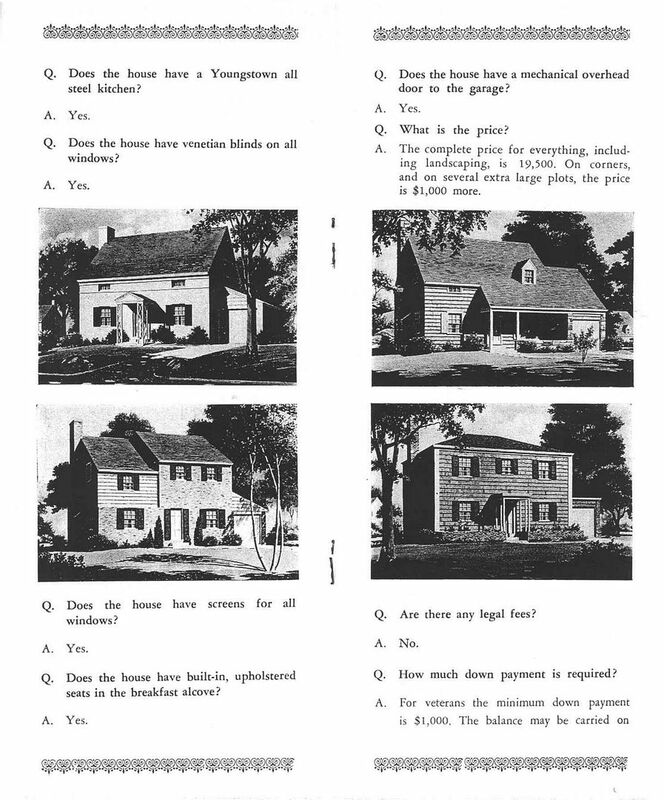 In the earlier years, even up through the first few years of Levittown, N.J., Levitt and Sons brochures were in the form of a booklet with a brief description of the community followed by a lists of questions and answers. Renderings of the homes available were pictured throughout. Floor plans were generally not included in the booklet, instead encouraging and relying on buyers to visit, inspect, and experience the furnished Exhibit Home rather than rely on a floor plan. Levitt and Sons relied on the house to sell itself. Page last revised 16 November 2012.